For readers of Christian fiction who are looking for something different, bestselling author Miriam Minger writing as M.C. 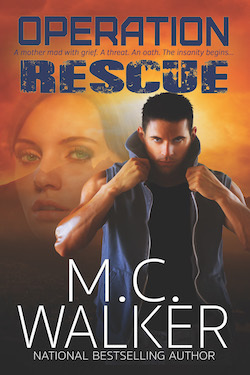 Walker brings you edge-of-your-seat suspense in an inspirational thriller unlike any you’ve seen before . . . Tragic real-life stories of mistaken identity have filled the news in recent years, a premise that fuels this chilling tale of an everyday woman forced to fight back against near insurmountable odds. Unspeakable tragedy and cold-blooded murder conspire against Clare Carson in an ultimate test of faith when her six-year-old son is kidnapped after a heart transplant and his abductors want her dead. A dying cop’s last words lead her to Jake Wyatt, who helps her discover the horrific truth behind her son’s abduction and offers to help her get Tyler back. With nowhere else to turn, Clare entrusts her life to Jake not knowing he has a deadly agenda of his own that could destroy them both.